Will you watch Pacquiao/Marquez IV? By Frank (Frankly) Livingstone: It was reported that GBP CEO R Schaefer told ESPN that they were notified that Pacquiao promoter, Bob Arum, was not interested in pursuing a fight between Mayweather and Pacquiao at this time. The reason being that Bob Arum is more interested in arranging Pacquiao/Marquez IV sometime in May or June 2012. This would come as a disappointment but a Pacquiao/Marquez matchup is an ideal option for Top Rank as the interest for the fight has gone ballistic after another “controversial” decision last Saturday. But you may wonder whether Bob has found an ace in his sleeve and is using this as a leverage for any negotiation with Team Mayweather. This unexpected event has thrown GBP and Team Mayweather’s Mega fight plan in disarray as Floyd was reportedly ready to fight the lil fella come May 5. They may need to find a suitable replacement for Pacquiao who has a strong PPV appeal. Perhaps Amir Khan would benefit from last Saturday’s fight and might get a call from Team Mayweather. Interestingly, Amir has expressed his desire for his buddy, Pacquiao, to retire and leave on a high note. I admire Amir Khan’s concern but with Pacquiao out of the picture, Amir would be the one who will benefit the most from his absence. We have to admit that boxing is business and it is the promoter’s job to get the most profitable fight for his fighters. Bob Arum realized that getting a Mayweather/Pacquiao fight into fruition would mean clearing a lot of obstacles. He tried twice and failed twice. 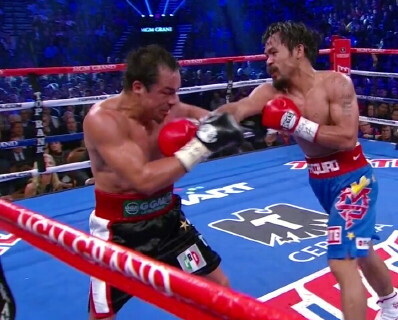 The Pacquiao/Marquez III result was the best outcome possible for a fight that was clearly a mismatch on paper. No definitive result means good business in the end. But some were arguing that even if Pacquiao and Marquez fight ten times, the result would be the same. It is like a habit that you can’t quit and still wanting for more. A Pacquiao/Marquez IV might be coming soon to your big screen in 2012. For us here down under in the QH suburb, we just can’t wait for this trilogy plus one to happen. We’ll just hope that we will have a KO result this time or else, the saga continues. Boxing » Juan Manuel Marquez » Will you watch Pacquiao/Marquez IV?